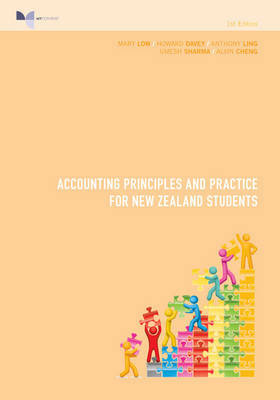 Accounting Principles and Practice for New Zealand Students is authored by Mary Low, Howard Davey, Anthony Ling, Umesh Sharma and Alvin Cheng. This book is designed to provide an introduction to the practice of accounting. After completing this text students should have a sound knowledge of the basic accounting system, an understanding of the relationship between source documents, journal entries, ledgers and full sets of accounts. Students will be introduced to the use of subsidiary ledgers, particularly in the area of debtors and creditors, as well as considering financial statements appropriate for sole traders and partnerships, the treatment of GST, and issues concerning cash reporting, inventory, and property, plant and equipment. Ethical considerations in accounting are also dealt with.